I’m happy to announce that my short story “The Winterberry” has just been reprinted in the new e-anthology Making History: Classic Alternate History Stories, edited by Rick Wilber. This book offers a classy selection of alt-hist yarns by some amazing writers, including Karen Joy Fowler, Gregory Benford, Harry Turtledove, Michael Swanwick and Eileen Gunn. Many of these stories were award winners, as are many of the writers. For you paper-lovers out there, the print version should be available soon. For trivia fans, I’ve included a snapshot of Alternate Kennedys, the short-story anthology in which “The Winterberry” first appeared, published by Tor Books in 1992 as a mass market paperback. And let’s not forget The Best Alternate History Stories of the 20th Century, where the story landed again in 2001. Finally, just for fun, check out this list of the Best Alternate History Stories according to goodreads. It’s an incredibly comprehensive list. I’m talking hundreds of books! Alternate Kennedys came in at a respectable 156, and the Best of the 20th Century at a slightly better 63. Books and stories about writers are a dime a dozen. Movies about writers are not terribly uncommon. But a good TV show in this narrow genre is a rare find, which is why I’m ever so happy to recommend Bored to Death, an HBO original series about a struggling noir author who begins moonlighting as an “unlicensed” private detective on Craigslist to help make ends meet. The show stars Jonathan Schwartzman, who brilliantly plays the role of Jonathan Ames, an insecure novelist and inexplicably overconfident gumshoe. Equally hilarious are Zach Galifianakis as comic-book writer/illustrator Ray Hueston, and Ted Danson as New York magazine mogul George Christopher. It’s a pleasure to see these three guys together on screen as they fumble their way through Jonathan’s ridiculous detective escapades, while trying to deal with their multiple neuroses, bad habits, and dysfunctional relationships with women. The only bummer about the series is that it ran for just three seasons (2009-2011). I’m in the middle of watching it a second time around and enjoying this trip even more than the first. You don’t need to be a writer to get this show — the comedy works on many levels — but if you are, all the better. Read the NYT recommendation for the show here, and watch it for free on Amazon Prime. I love short stories, and it’s always a joy to read an anthology that includes the work of friends. So it is with Strangers Among Us: Tales of Underdogs and Outcasts, a sometimes heartbreaking, sometimes tragic, and often inspiring gathering of tales about people wrestling with mental illness. Whether we realize it or not, we all know someone who is fighting with depression, PTSD, bi-polar disorder, anxiety, or some other mental challenge. These stories, in their own unique ways, shine a light on such struggles and help us understand them through the gentle art of storytelling. Of note: The anthology and some of its authors were nominated for several Canadian literary awards. A portion of the book’s revenue will be donated to the Canadian Mental Health Association. Buy many copies and give them to your friends and loved ones, especially those who are dealing with some form of mental illness. They’ll thank you for it. Check it out on goodreads, and read the Kirkus review here. A new Nick story, “Bella and the Blessed Stone,” is in the March/April 2019 issue of The Magazine of Fantasy & Science Fiction. It should be available any day now. Like on March first. Yay! 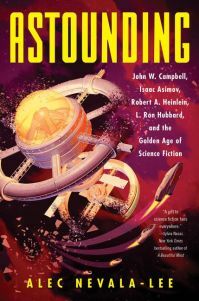 Phil Ebersole reflects upon SF’s golden age with this thoughtful review of the new book ASTOUNDING. Enjoy! This book is the story of how John W. Campbell Jr., the editor of Astounding Science Fiction magazine, and three writers most closely associated with him, shaped the American mind. It provides a detailed and objective account of the personalities, relationships and accomplishments of these four figures, both for good and ill. In 1937, when Campbell became editor of the magazine at the age if 27, popular science fiction was a minor subset of the action-adventure genre. His ambition was to make science fiction not only a source of entertainment, but a way of thinking about science and the future.